Thank you for considering Air Charter Advisors for your luxury private flight to Sydney, Australia. Our boutique aviation team offers an intimate and all-inclusive experience, and we always go the extra mile to ensure client satisfaction. Safety, comfort, efficiency, and transparency are our top priorities, and you’ll see that while working with us. 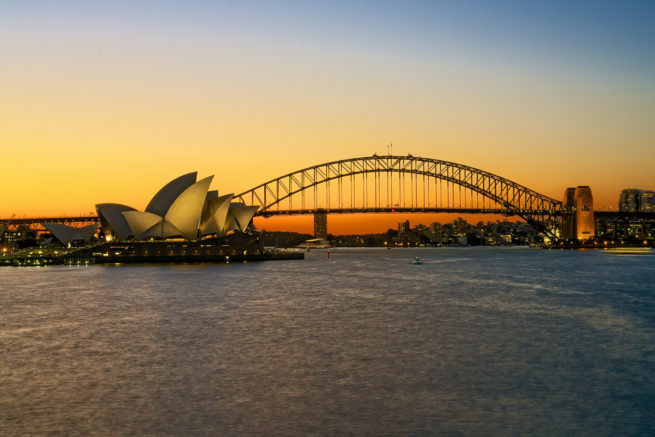 Due to Australia’s relative distance from most of the world’s societal hubs, private flights are fairly common, particularly business executives, sports teams, celebrities, and vacationers, especially in and out of Sydney. We can also arrange domestic charter flights such as medical air ambulance flights and non-emergency medical flights, as well as one-way empty-legs for extended stays or families relocating to the South Pacific. Our private air charter company is Wyvern-certified, using only private aircraft operated by FAR Part 135 (or foreign equivalent) air carriers. Our growing list of distinguished clients has ranged from royal family members, heads of state and C-level executives, to celebrities, personal assistants and leisure travelers from around the world. Enjoy the peace of mind you get from working with a jet rental company you can trust, and we’ll be your local and global aviation solution for luxury air travel, aircraft acquisition and private jet management. Give our team a call or request a quote for your private charter flight to Sydney. Our team is here to help you with all of your private aviation needs, from booking your aircraft and creating its flight itinerary to arranging gourmet in-flight catering, luxury ground transportation or accommodating any other special requests – consider us your comprehensive solution for all things private aviation in Sydney, Australia. Private jet charter clients will find that Sydney is extremely multicultural. People of all ethnicities and religions congregate in the center with nearly non-existent friction. The locals tend to adopt a “live and let live” attitude, and that’s probably why everyone describes Sydneysiders as such pleasant and friendly people. The arts thrive, families blossom and live happily, and businesses pop up and grow the economy. The city wasn’t always as it is now, though. It’s come a very long way from its prehistoric roots. The history of Australia’s largest city dates back to well before people started recording events on stone and paper. The Aboriginals inhabited the area until their civilization was uprooted by European settlement. Sydney started out as a one-kangaroo-town, and was very slowly built on the backs of the settlers who toiled in its fields; drought, disease, and famine plagued the city’s development. As a colony, they even had to use rum as currency for a time (not sure if that’s all that bad, though). However, the situation soon improved, and more and more people began coming to Sydney – especially during the mid-19th century gold rushes. The city quickly escalated from a population of only 40,000, to one of 200,000. This exponential increase is what lead to the Sydney of today, 4.3 million people strong – and counting. Charter your private flight to Australia with our Sydney Jet Charter service. Modern Australians are well-known for their family-focused principles, and much of everyday life here is centered around those edicts. A firm belief that parents deserve time with their kids, for instance, means a great majority of shops close promptly at 17:00. There are exceptions to the rule, but jet charter clients should still plan their shopping trips accordingly. Not only will visitors be surprised to see the shops shutting down a bit on the early side, but also the Sydney’s nightlife. This is a recent change, and it’s been the source of much controversy and contention among those affected by it. A handful of alcohol-related deaths lead to the advent of laws limiting the sale of alcohol after certain hours. These “Lockout Laws” will certainly affect our jet charter clients flying private to Sydney. Take away liquor cannot be purchased after 22:00. Shots will not be served after midnight. Clubs may not accept new patrons after 01:30, and last drinks are sold at 03:00. These laws are strictly enforced throughout the city. They’ve changed the face of Sydney, and major nightlife hubs like King’s Cross are no longer the bustling centers of revelry they once were. However, it should be noted most venues affected by the lockout are large clubs – not bars or casinos. Smaller bars and breweries with capacities of less than sixty still parade on into the wee hours of the morning, and are enjoying unrivaled popularity under the new regime; casinos are also reveling in the extra patronage. Sydney still has a vibrant nightlife that can be, and still is, enjoyed by thousands of people every night. It’s just important to plan ahead a bit more than before. Flying private jet charter for a weekend at the casino is becoming more and more popular, and there is no better place to bet on a horse race or hit the casino in Oceania than in Sydney. With over 80% of its population admitting to gambling in some form or another (according to the BBC), Australia is often associated with gambling culture. This correlation is never more evident than in its largest city. Sydney promotes the activity by placing very lax laws and regulations that make it easy to find a gambling activity close by. Horse races, slots, poker, you name it and this city’s got it. If you’re planning on doing a bit of betting while you’re in the area, then stop by The Star Hotel and Casino. It has hundreds of tables, slots, and games of every variety, so you’ll have no problem finding your particular cup of tea. Enormous shopping malls, all of the most high-end brands, intimate boutique designers, and personal shopping assistants: these might not outweigh the images of opera houses and kangaroos that most people get when thinking of Australia, but they’re most certainly there – and Sydney is absolutely teeming with them. Back in the 1960’s, the United States’ newly developed shopping mall culture reached the eastern shores of Australia. Since then, the movement has exploded into a lifestyle deeply entrenched in the city’s day to day. Locals and Jet Charter Sydney passengers alike go to malls to buy clothes, appliances, knickknacks, and just about everything else. For shopaholics interested in paying a visit to some of the local stores, you can’t go wrong with the Queen Victoria Building in the city business center. Its three floors of fashion, jewelry, and gifts are sure to keep you busy for hours. 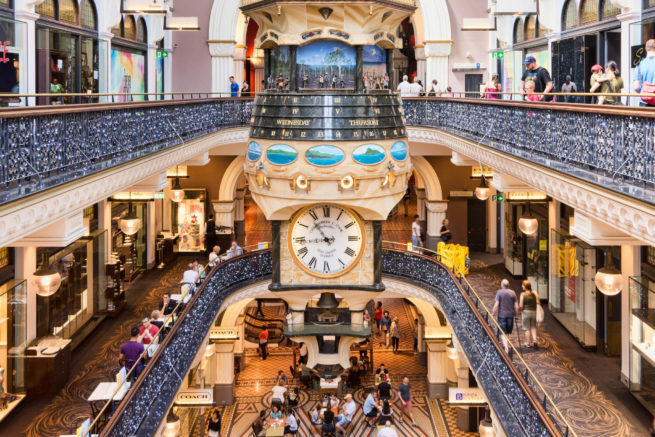 Plus, you can stop by the iconic Tea Room QVB for a bit of high tea afterwards. If you’re more interested in Australian designer brands, check out Paddington’s Oxford Street. It should also be noted for jewelry fanatics, there is no better place to buy opals than in Sydney. Australia has a bit of a monopoly on the world’s supply of these precious stones, and much of the supply is concentrated in the city; you certainly won’t find more elsewhere. With its great weather, fitness-minded culture, and outgoing and friendly population, Sydney is a breeding ground for athletic competition. Australians love sports, and Sydney exemplifies this love every single day. Whether it’s surfing, beating each other up in Rugby, or testing their limits in Cricket, the people here are constantly on the move. The only activity that can come close to sports, in terms of popularity, is spectating, and that can get just as athletic if you do it right – which the Sydneysiders certainly do. As for the less spectated sports… Golf, netball, tennis, and soccer are most frequently played for fun, and there are plenty of facilities where jet charter clients can participate. If you’re flying private to the area, you’ll definitely want to check out one of the sporting events while you’re there. However, there’s quite a bit of contention between which sport and which teams are best, so you’ll want to do some research. Many would agree the AFL, Australian Rules Football, is the end all be all. This no-pads version of the traditional U.S. pastime is extremely fast-paced and aggressive, and the city’s crowds absolutely love it. Rugby tends to coincide with the AFL league and enjoys slightly less of a following than AFL, though the fans tend to make up for it with a bit of extra fervor. Cricket dominates the summer sports scene, and is a must-see if you’re in the area. The majority of private jets flying to Sydney are business related. This doesn’t necessarily mean business executives are the only ones using our jet charter services. We also arrange jet charters for sports teams, musicians, and anyone else with cause to be in the area. 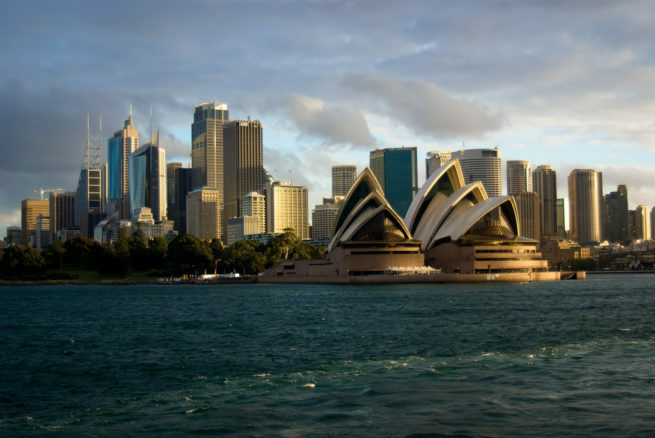 It only means that, in the Asia Pacific, Sydney is arguably Australia’s biggest economic hub. Most Australian’s know this, as Melbourne is the only competition, who already markets itself as the country’s cultural capital. With the world’s largest natural harbor and Australia’s largest population, it’s easy to see why it’s where big companies end up. 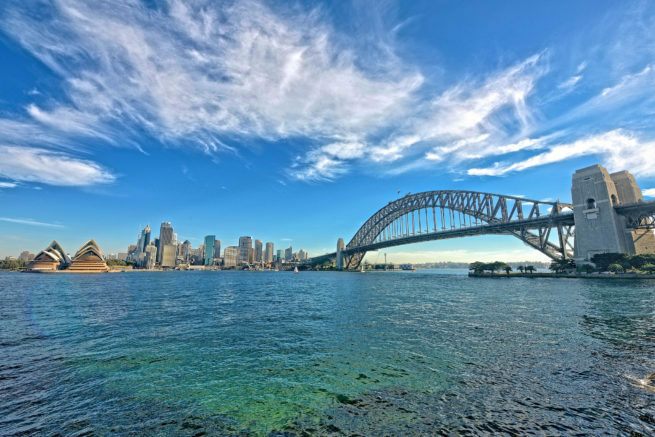 The world knows Sydney is the place to be for business in Oceania, evident in the fact that nearly half of the country’s most important companies are headquartered there. The city is also consistently ranks in the top 10 of best cities for tourism, most important global cities, and most important economic hubs. These factors contribute to the amount of business flights in and out of Sydney ’s airports. If you’re interested in book a private flight for a business event or meeting in the area, our Sydney Private Jet Charter team will be more than happy to help you out. Chartering a private jet offers unrivaled comfort and peace, so you and your team can focus, relax, and do what you need to do to be on your A-Game. Come flight day, our transparent and hassle-free booking services help to ensure you get exactly what you’re expecting. Contemporary is the name of the game in Sydney hotels. They generally boast ocean views, large floor plans, and excellent service. It’s easy to write the city’s hotels off as unoriginal and uninspiring, but that’s simply not the case. Each hotel fits the local culture extremely well. Sydney is just a contemporary-minded city in comparison to European and Asian capitals; it doesn’t have the 16th century building or cultural land marks of other cities. What it does have is some of the best weather on the planet, the best ocean views of any metropolis anywhere, and a huge budget to pack the hotels full of glamorous and decadent amenities and accouterments. Sydney firmly says “out with the old and in with the new”, and it’s a refreshing take on modern day luxury. Request a Quote or give us a call at 1-888-987-5387 to speak with one of our Sydney Private Jet Charter agents for your next luxury vacation, business trip, or special event. We offer unlimited free quotes, so request one on our page or give us a call anytime; we operate 24 hours a day and 7 days a week. We look forward to helping you with your private flight to Sydney.